LAKELAND -- The Methodists United in Prayer (MUIP), previously known as the Cuba/Florida Covenant, is in a season of blessings, according to Bishop Ricardo Pereira of the Methodist Church in Cuba. 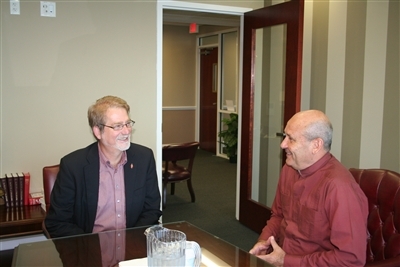 Bishop Ken Carter of the Florida Conference meets with Bishop Ricardo Pereira of the Methodist Church of Cuba. Photo by Tom Mulryan. The blessings have come and will continue to come from beginning new and nurturing existing connections and relationships, whether they are person-to-person, church-to-church, or mission-to-mission, he said. Bishop Pereira visited Florida the first week in October. One of his main goals was to work with the MUIP conference task force to identify barriers to the ease of traveling and relationship-building between Florida and Cuba and ways to remove those obstacles. He also met with Bishop Ken Carter and his wife, Pam, for the first time. The Carters committed to attending the first graduation of the Methodist Seminary in Havana in May 2013 and joining a celebration of 130 years of Methodism in Cuba and 15 years of the MUIP relationship while there. “We are enriched by new things happening in MUIP,” according to Icel Rodriguez, Global Missions director for the Florida Conference. • A Florida mission team visit to the district superintendents in Cuba. Left to right, Terry Denham, MUIP chairperson, and Icel Rodriguez of Global Missions meet with Bishop Ricardo Pereira of Cuba. Photo by Tom Mulryan. All of this would have been improbable, if not impossible, three years ago, observed Terry Denham, chairperson of the MUIP task force for the past two years. Back then, travelers to Cuba were barely able to secure visas. “We have seen obstacles overcome over and over again,” said Denham, a member of John Wesley UMC in Tallahassee. The team’s purpose is to iron out any wrinkles in the travel logistics. These could be related to “travel regulations, money, health, or church issues in Cuba,” he said. According to Rodriguez, one of the greatest blessings resulting from the MUIP is that for the first time in history, Cuban missionaries are serving in Africa. In 2011, Revs. Leonardo and Cleivy Garcia, clergy members of the Methodist Church in Cuba, began serving an extension ministry as missionaries to the East Angola UMC. Their responsibilities include teaching at the Faculty of Theology in Quessua, overseeing the orphanage/boarding house and coordinating Florida volunteer groups. And, the covenant’s reach and impact will expand further next year when Bishop Pereira participates as the keynote speaker at the Holy Spirit Encounter in March 2013 in Zambia, where Florida missionaries Delbert and Sandy Groves serve. The MUIP blessings are linking ministries of Florida, Cuba, East Angola and Zambia. “A blessing tastes better when we share it with someone else,” Bishop Pereira said.